You are here: Home » The Minions are lose at the Beeb! Earlier today we were sent over this great mini-movie that involved minions, the BBC and a lot of people and sets that you will recognise. The story of the mini-movie is summed up in the below synopsis. 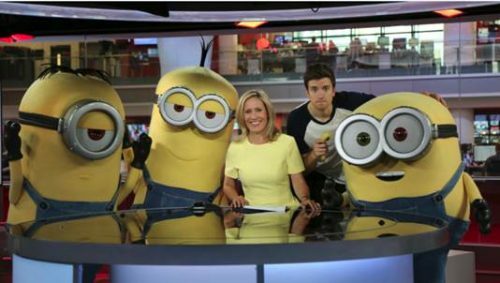 BBC Radio 1 DJ Greg James has had his patience tested to the limit after being held responsible for three mischievous Minions – Kevin, Stuart and Bob – while they are in London for the release of their new film ‘Minions’ on Friday 26th June. In the mini movie created exclusively by BBC Radio 1, The One Show host Alex Jones asks a huge favour of Greg – to get the Minions to their live appearance on the show. However the naughty characters slip from under Greg’s nose and cause havoc around the BBC – gate-crashing famous sets such as Doctor Who, BBC News, Blue Peter and even the BBC Philharmonic Orchestra.